Murder is defined as an unlawful act that involves the killing of one individual by another. While the exact definition of the crime of murder varies depending on jurisdictions, the consequences of a murder conviction are the severest of any crime. If you have been charged with manslaughter, vehicular manslaughter, homicide, or any comparable charge, you probably do not need anyone to tell you that your very future is totally on the line. What you must have RIGHT NOW is the most resourceful, effective legal counsel and expert representation you can find. If you or a loved one has been accused or charged with murder, it is extremely important to seek the immediate assistance of a qualified, serious felony attorney who can aggressively defend your legal rights and ensure that you are not unduly punished. Vincent W. Davis is that lawyer! Mr. Davis is a serious felony lawyer who has been winning serious criminal cases for 26-years. He is highly respected and highly successful. When your very life is on the line it’s time to talk with the best. 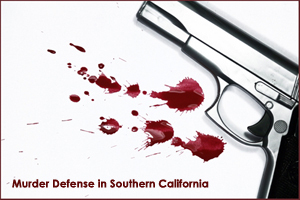 No matter the exact charges leveled against you — from aggravated assault with a weapon to attempted murder, or even first-degree murder — you need a proven Southern California homicide defense attorney. Vincent W. Davis and his associates have 60 years of combined experience in serious trials, winning dismissals, outright acquittals and other positive outcomes. When your case calls for a serious felony trial attorney with a 26-years experience in both state and federal court, you will be in good hands with Vincent W. Davis.